Another exciting addition to the long list of Linux-powered eBook readers is the recently introduced nook. Developed by Barnes & Noble (the largest book retailer in the United States), nook is the first electronic book reader that is based on Google Android. It will surely go head to head with the Amazon Kindle as it is loaded with excellent features and over one million titles to choose from. The nook will include Wi-Fi and AT&T 3G wireless connectivity, a 6-inch E Ink display, a separate, 3.5-inch color touchscreen LCD that serves as the primary input device, a 2GB built-in storage, and an expandable microSD slot that can be loaded with up to 16GB card. One unique feature of the nook is the "LendMe" feature. Some books are licensed by their publishers for sharing, which will allow the purchaser to share a book once, with one other user, for up to two weeks. 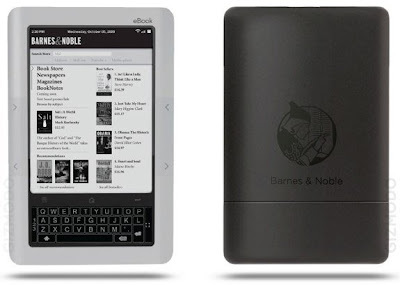 The nook is scheduled to be released by November 30, 2009 and will be priced at US$259. Amazon is now giving $20 rebates on those who purchased the International version of the Kindle. For those of you who are planning to buy an eBook reader and are torn between nook and Kindle, a comparison of the two can be found HERE. Does anyone know if the device can properly display files in the comic book format (cbr or cbz)? If so, I'm getting me one of these!